Music: The Pride of New York tonight! How It’s New York: The name of the band is Pride of New York . Isn’t that enough for ya! How It’s Irish: And they play Irish music. 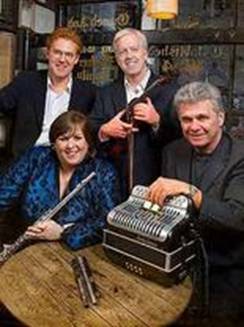 What a supergroup this is: Joanie Madden, Billy McComiskey, Brian Conway, and Felix Dolan. The Pride of New York are playing at the Irish Club in East Haven tonight, 7:30 p.m. If you can’t make the concert, you can (and should! ( get the CD– and check out the video we’ve got! A couple of years ago during Catskills Irish Arts Week, Pride of New York the Pride of New York, an Irish supergroup made of of All-Ireland flutist, Cherish the Ladies’ Joanie Madden, All-Ireland box player Billy McComiskey, All-Ireland fiddler Brian Conway, and keyboard and flute player Brendan Dolan, debuted their CD. I stood in the crowded hall with WFUV’s Kathleen Biggins, wondering aloud what was it– and there was definitely something– that made them sound so New York. “Chutzpah,” Kathleen answered without blinking an eye. Technically we could file this under Jirish then too, eh?